One of the highlights of going to New York City for the Red Carpet Premiere of War Horse was the opportunity to interview Academy Award Nominee Emily Watson, who plays the character “Rose Narracott” in the Steven Spielberg-directed film. 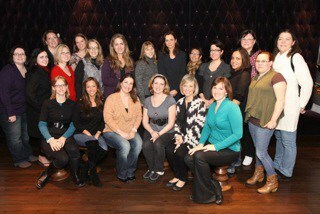 The London-born actress took time out of her schedule to meet with 20 very excited mommy bloggers to talk about working with Steven Spielberg, juggling motherhood and an acting career, and her favorite parts of working on War Horse. Q: How did you get involved with the project? Emily Watson: I got the call…my agent rang me…Steven Spielberg’s doing War Horse and I’d seen the play in London at the National. And I went and had tea with him. At Claridge’s. And he said, I’d like you to do this…it was pretty exciting. Q: Were you familiar with this story prior to doing the film? Emily Watson: I saw the stage show in London. And I was eight months pregnant. And you know what that’s like. So after about ten seconds, I turned to my husband and I said, “I don’t think I’m gonna get through this.” It’s a very emotional thing…a boy in love with a horse and their great adventure. It’s kind of an anti-war film for kids as well, I think. It’s in a very, very simple way, like…war is inhumane. And the way we treat animals reveals our humanity. You know, it’s a very simple thing. Q: How long did it take to film “War Horse”? Emily Watson: Two weeks. Two and a half, three weeks. Three weeks, no, three weeks, not long…We were at the easy bit, I think, the trenches and all that was a huge, huge undertaking and…doing all that stuff with the horses dragging the machine guns up the hill, and no-man’s land with all that wire and everything–without harming a single horse–was an incredibly complex operation…they did it really carefully but…when I read the script, I went, oh my God, I know it’s Spielberg, but how…are they gonna…? Q: How many horses were used for Joey? Emily Watson: There were actually 14 Joeys…but they’re all superstars. Those horses, they’re like, you know, Seabiscuit and Black Beauty and…they’re really amazing. Amazing horses. And all the boys did…two months training…They had to learn to (some of them) ride in the first place. But to do a full cavalry charge. Galloping. With a saber. Like that. I found that, just the idea of it, completely terrifying; if anything had gone wrong, it would have been carnage…I asked them about it and they said they just set it up in such a way that…everybody was so safe. It really was safe. But it’s incredible. I mean, it’s incredible sequence. Q: It’s such an intelligently shot film. Emily Watson: That’s a turning point in history…when the cavalry faced machine guns for the first time, that was like, the world will never be the same again…the officer who has qualms about attacking them if they don’t know we’re coming. You know, this sort of chivalry of war. Gone. Q: What was the most memorable part of shooting the film? Emily Watson: I don’t know if any of you know Dartmore…have you ever been to England? OK, it’s the most beautiful part of the country. It’s in the southwest, it’s in the county of Devon which is very fecund and rich and it’s a real food producing, very traditional, cream and honey and eggs…but in the middle of it this moorland called Dartmore…you can stand on it and not be able to see any sign of human habitation whatsoever. With these ancient outcrops of rock. That was pretty special to be there. But getting a call from Steven Spielberg is not a bad day. Emily Watson: Well, since we’ve had the kids, we’ve been to Cornwall in England a lot, which is, I don’t know if anyone’s been there, it’s beautiful. It’s very green, but it’s on the coast and there are beautiful cliff tops and sandy beaches…If I was to…rewind a few years, Amalfi coast. Emily Watson: I think the no-man’s land sequence, where…those young boys are running…they go over the top and they’re running through and then there’s the gas and then the horses…that sequence is so powerful…The film to me then suddenly elevates into something else. It’s like that war…people are forgetting about it…it is so horrific and so pointless, that war. And the…film really gets that, I think. Q: What are the differences between working with Steven Spielberg as opposed to other directors? Emily Watson: It’s totally different every time you do it; just have to say Robert Altman, what an amazing man. What an amazing privilege to have known him, let alone have worked with him. He was so young at heart. Right until the end of his life. He was 78 when we did Gosford Park. And he…adopts people, me and my husband, he just kind of went, “hey guys, come on in, be part of my life, be part of my family.” And he was sort of just wicked and naughty and funny and very democratic. Very irreverent. Just a really fantastic thing to have had in my life. Lars Von Trier…I mean, as an actress that was the most incredible experience and I didn’t really know what acting was before I did that. And…the way that he works, he allows you to go to extremes. Not in a dangerous way…it’s just so all consuming…he allows you to go to a place that’s really very extreme. And that’s such a stretch as an actress. Steven [has] obviously done a lot of incredible technical feats and he’s a great action director, but he’s still very focused on performance. But I’d say the thing that those three very, very different people have in common is that they are all completely compelled to tell stories. And would probably die if they didn’t. I think…it’s like a calling. Q: What is the draw for a particular film for you? Emily Watson: I guess I’m sort of at the stage in my life where it’s what I do, and it’s how I feed my family…at the moment that’s what compels me…if in my fantasy life I stay home and I write…but I do love, love, love acting. And I think if I don’t do it,all my wires start going wrong,I need it now, I need it…it’s like an athlete who needs to train. Otherwise you kind of feel wrong…I don’t have that sort of really driven ambition…it’s a balancing act, I think. Q: What is an average day of filming for you? Emily Watson: Very early…if the location is a long way away, quite often they will drive you somewhere that’s an hour away. And then at my age it’s usually an hour and a half at least in hair and makeup. Usually crew call is 8:00. So you have to have traveled for an hour and a half. So yeah, it’s an early start. You can do 12-hour days. So when you’re working, it’s incredibly intense and exhausting, but it is a part time job. And when you’re not working you’re home. Q: What is your favorite thing to do on your down time? Emily Watson: …When I was a kid…I painted. And I actually won the school art competition and my teacher wanted me to go to art school and I just kind of fell out of it. And it just sort of went away…and I ended up doing this. And now I’ve got kids. I am painting, you know, with them, and I’m making taxis out of Wheat-A-Bits boxes and, you know, doing all that stuff. But I love it. Emily Watson: You know what, I’ve tried to be a knitter. On the set of Punch Drunk Love, a Paul Thomas Anderson film–Paul had this thing, he’s another…one I’d put in that group of extraordinary guys, and he’s also a good friend and we have kids the same age–but anyway, on the set…he wanted me not to be doing a whole lot of method acting preparation, he just wanted me to turn up and be myself and be fresh and do something totally different. So he said, “I need you to something to do on set, here’s some knitting. So he gave me some knitting. And I really tried…I just, I don’t have that kind of really precise, neat, methodical…it’s a different gene and I don’t have it. Q: Have your kids seen War Horse? Emily Watson: They’re too young now…maybe the first 20 minutes and then enough. Q: Did your kids get to see the horses? Emily Watson: The first day of shooting of this coincided with Juliet’s very first day at school. So I had to have a bit of a to and fro with Spielberg saying, “I’ll do the movie, but I have to be there on the first day…I am taking her to school.” So no…they stayed home and I came home on the weekends…those are the kind of things that are tough to get around ‘cause not everybody is as nice. Q: Do your kids understand what you do? Emily Watson: Kind of…I haven’t made many movies that they can see. They’ve seen The Water Horse, but they’re…not really that interested. I mean, my daughter occasionally will say something…we were in Mexico–the kids came out to Mexico with me–and we were driving along and there were some people waving from the side of the road, and she said, “Mummy, you have to wave to them ‘cause they know you’re famous.” But they’re not, she’s, they’re not really that aware of it, and…this world of doing all this is totally separate from my home. And…I run around in London incognito and just don’t bother. And I don’t let it be a thing. Q: What is the difference in perception of you in London compared to New York? Emily Watson: I think I get recognized in London but people are very British and just leave you alone…When I come here, it’s because I’m here to do a whole press thing and people know that you’re coming…So…I feel the attention here…I guess if you want attention, you get it. And if you don’t, you don’t. So I’m very lucky that I’m in a kind of zone where I can dip in and out. Q: Have your children impacted how you access emotion as an actress? Emily Watson: That kind of irritation and anger…is just like there, you know, when you’re around kids or it can be…quite easy to access. Q: But you also seemed heartbroken. Emily Watson: I have to be careful. Putting your real feelings into that…when I was younger, I used to do it a lot. And I think you open neural pathways that are even if it’s for totally fictional reasons, you know, take for instance you imagine that your children are in an accident or, you know, and that can set you off and make you feel emotional. Which is maybe what you need to get in the right place. But I have a syndrome which is called “catastrophization”. And I am particularly bad after childbirth. When you know, when you’re feeling a bit bluesy and…everything’s a bit weird. Everything was like, “oh my God, what if that TV falls on your head?”…I’ve opened that door too many times. It’s like a muscle that I have ‘cause I’ve done so many desperately sad movies. Uh, so I have to be really careful to let it go. And tell myself very clearly that it’s not real. Q: How do you juggle being a mother and an actress at the same time? Q: What advice do you have on how to balance a successful career and being a mom? Emily Watson: It’s so hard. I just say, give yourself a break ‘cause it’s really hard. And don’t believe it when you think other people are making a success of it and it’s all smooth and easy, ‘cause it isn’t. You know…it just feels like there’s never enough of you to go around. And sleep? But hey, I am having my cake and eating it, so. I’m very lucky. Q: What is your greatest accomplishment as a mother? Emily Watson: I think that…your children kind of learn things from you by osmosis, don’t they? There are things that you don’t realize that you’re doing that are good. And I went into school a few weeks ago and had a meeting with the teacher, and she said, “You have a lot of books in your house, don’t you?” And I was like, “Yeah, how’d you…?” she said, “Juliet is just absorbing stories and literature from you having a lot of books and reading a lot in the house.” It had never really occurred to me that that was in any way unusual or, you know, but she said it’s really, really a thing. So I guess that’s something we’re doing right. It’s hard, though, isn’t it? Q: Do you have any aspirations to do comedic work? Emily Watson: I do, I’d love to. Nobody ever asks me. I have no sense of humor whatsoever. I’m a very serious European actress. No, I have done little bits and pieces. I did a film called WA-WA, written and directed by Richard E. Grant. Do you know who he is? Oh, he’s just fantastic. Punch Drunk Love is kind of a comedy…I’d love to do more of that stuff. But I never get asked. Q: Which role was more fun to play, the mother in “War Horse”, or the mother in “Angela’s Ashes”? Emily Watson: We had 27 kids on that movie. Because there were three age groups, we had three different actors playing Frankie. And…all the brothers, as well. So between the three, every character had three different actors. So there were a lot. And that was really, it’s very difficult to shoot anything in an organic, grown up way. Everything has to be very…oriented to getting the kids shot. And you have to work around it. So that’s quite frustrating. Q: So you were actually parenting on the set. Emily Watson: You have to engage with them, you have to help them, you have to look after them. And you have to tell them off occasionally…to think about your own job at the same time is…a lot. But you guys should also see Appropriate Adult, which is going out on Saturday. Very different. Not one for the children. It’s about, do you know who Fred and Rosemarie West are? They were the worst serial killers in British history. And Dominic West plays Fred West. And he’s brilliant. And it’s a sort of verbatim drama taken from the police interviews…he was arrested and investigated and I play an appropriate adult, which is someone who is like a social worker who sits in on police interviews to make sure that the person knows what’s being said to them. It’s usually an underage…minor with learning difficulties. So this woman who’d never done it before, never had any training, finds herself in the room with this appalling monster. And they fall in this very strange relationship. It’s all true, it’s an amazing, amazing story. Very creepy and different. Some interesting tidbits. I’m looking forward to seeing the movie.